Game 1: Daymond Langkow scores twice against Philadelphia. Game 2: Daymond Langkow, again, scores twice against Vancouver. Game 3: Kristian Huselius scores twice against Detroit. Game 7: Daymond Langkow scores twice against Los Angeles. 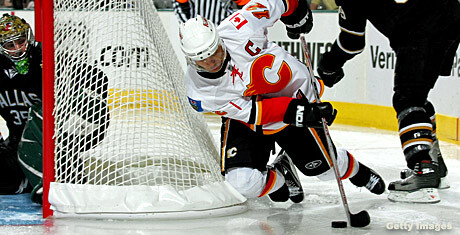 The streak ended last night as four separate Flames scored in a 4-1 victory over Edmonton. 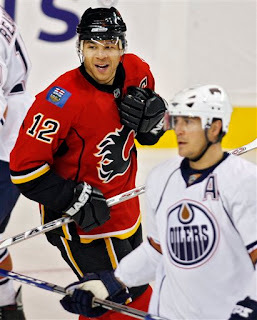 Jerome Iginla and Dion Phaneuf both as a goal and two assists in the game. Bad news is the streak is over, good news is they are playing well. After a 0-2-1 start, they are now 4-2-2. Tuesday there was a brainstorm session at work. I was asked to join. The first part of the day was to get physical into the theme of the brainstorm topic. We all met at Adventure Plex in the morning. Anyway, we got suited up in crotch enhancers and germ headgear. The venue offers a full gym, some wire walk thing, and rock climbing. I had a blast, the wire walk was sketchy, but fun. We were about fifteen feet above the ground, walking across some wires along an obstacle course. As usual, being the graceful guy I am, I almost ate it on the criss cross wire. The course is designed to teach teamwork amongst participants, but if you try not to analyse it, it is pretty fun. Rock climbing was my favourite...because, it did not require said teamwork. Plus, I have always wanted to crawl like Spiderman. If you have never rock climbed, I recommend it. It is a lot of fun and a great workout at the same time...and you get to be like Spiderman. Now, I want to get climbing holds and mount them on the wall in my garage so I can do this at home.